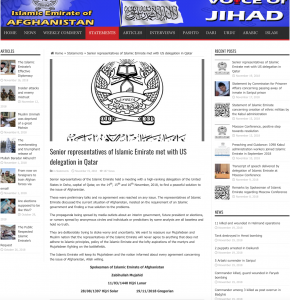 The Taliban confirmed that it met with a high-level delegation of US officials in Qatar, and quashed news reports that the group wanted the Afghan government to postpone the April 2019 presidential elections and establish an interim government. Yet again, the Taliban insisted that “an Islamic government,” a not-so-vague reference to its Islamic Emirate of Afghanistan, rule the country. US envoy Zalmay Khalilzad, who has been tasked by the Trump administration to negotiate a peace agreement with the Taliban, claimed “there is an opportunity for reconciliation and peace” and said that Taliban negotiators are “saying they do not believe they can succeed militarily.” The Taliban’s actions on the battlefield and its daily public statements indicate otherwise. 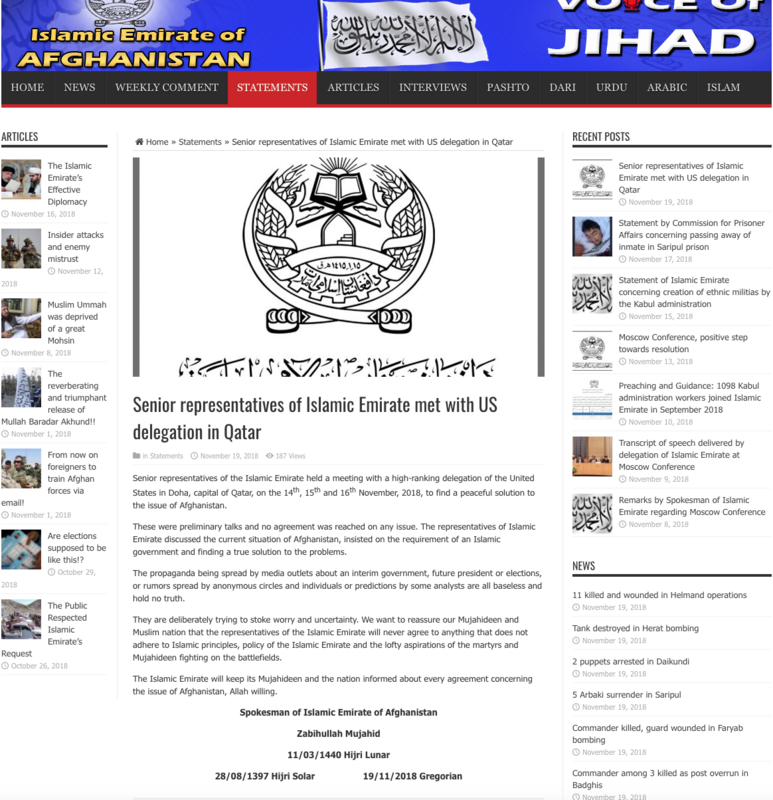 In Mujahid’s response to press reports of the meeting, it described the meetings in Qatar as “preliminary talks” and said that “no agreement was reached on any issue.” The Taliban has, as it has in failed talks after the US surge ended in 2013, demanded that its leaders be removed from the United Nations Security Council sanctions list, its members freed from prisons, its political office in Qatar be officially recognized, and the end to “propaganda” against the group, before it actually starts negotiations. The true solution, the Taliban has insisted for well over a decade, is the withdrawal of US and western forces. Only then, the Taliban claims, can “peace” be considered. The withdrawal of Western forces would of course put Afghan security forces, which are struggling to maintain control of increasingly smaller areas of the country even while the US and NATO are present, at the predations of a confident Taliban. The reference to the “Islamic government” that Mujahid insists must replace the current Afghan government is the Islamic Emirate of Afghanistan. The Taliban uses these two terms interchangeably in its statements. In its last statement laying out its conditions for peace, the Taliban referred to itself as the Islamic Emirate of Afghanistan 61 times. The Taliban has insisted that the Islamic Emirate of Afghanistan is the only true and Islamic representative of the Afghan people. It has referred to the Afghan government as an “un-Islamic” “stooge” and “puppet” of the West, and has refused to share power with it. While some Afghan watches may dismiss Mujahid’s statement as potential damage control or spin, the fact is that the Taliban has consistently adhered to its very public statements about its prerequisites for negotiations, and its ultimate demand for peace. The Taliban even walked away from preliminary talks after the surge, arguably when it was weakest at any point during the 17 year long war. Can’t the US understand the English that the Taliban speak? The US seems to be at odds with whatever they claim and with all the US bluff and bluster along with painted optimism, one is more inclined to believe the Taliban – that the Americans have lost the war. The Taliban want the Yanks to leave first before they talk to the puppets in Afghanistan. The only alternative one sees is that the Americans have lost this war as well at the cost of billion upon billions of American taxpayers money and the alleged super power is no longer one. We should have understood something when the Taliban said no to our ultimatum to turn over BenLaden(sp) after 9-11 in the face of the most powerful army in the world when they had a nothing army and a very poorly run government…and they knew it. That was some 17 years of war ago.